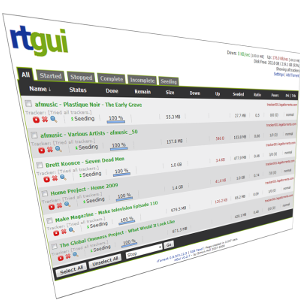 rtGui is a web based front end for rTorrent – the Linux command line BitTorrent client. It’s written in PHP and uses XML-RPC to communicate with the rTorrent client. List all torrent downloads or by started/stopped/complete/incomplete/seeding status. Ajax-style refresh information without reloading page. Sort view by any of the displayed columns. Upload torrent to rtorrent watch-directory. Set priority per torrent or file. RSS Feed of completed torrents (rssfeed.php). Does not require mySQL or any other database. Tracker URL display with configurable colouring. Integrated RSS News Feed reader – download torrents directly to rTorrent (still work-in-progress). The project code is hosted on Google Code, or is available in ‘most’ Linux repositories (Debian, Ubuntu, Redhat, SuSE) for quick and easy installation.